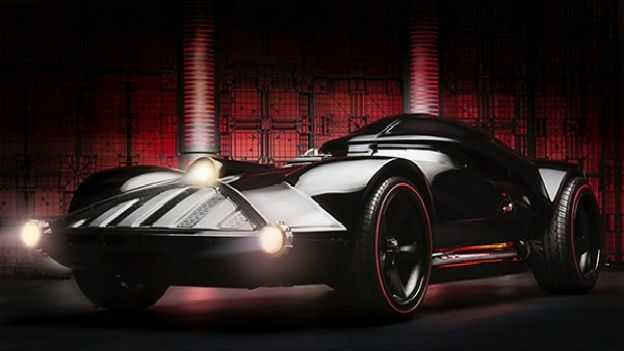 Comic-Con gives us many great things, but this Darth Vader-inspired motor could be the best of the lot. What car does Darth Vader drive? Thankfully, this isn't the opening to some terrible Star Wars-themed joke because the folk over at Mattel, and particularly Hot Wheels, have just revealed their vision of the Sith Lord's ride during Comic Con at the weekend. But this isn't the tiny replica you'd expect from the miniscule toy manufacturer (although you can buy a 1:64 version) but a fully-functioning, high-performance machine, complete with a 526bhp 6.2-litre V8 engine pinched from the previous generation Chevrolet Corvette. To ensure its driver is “feeling the force” when behind the wheel, the car's makers have installed a number of unique nods to George Lucas' iconic franchise, including Lightsabre lights mounted on the running boards, a steering wheel that is shaped like Vader's personal TIE Fighter and a cockpit that yaws open like gravelly-voiced villain's helmet in The Empire Strikes Back. Bryan Benedict, Hot Wheels designer and the man behind the project, wanted to include as many Star Wars references as possible during the vehicle's creation, which means fog and sound effects pour from the cockpit when the roof opens, but he also wanted to create a car that could perform on road. So, although Darth is getting on a bit now (well, he's dead), he is no slouch, as the full-scale replica has been clocked at 80mph on the open road, yet its creator claims it can go on to tickle the 150mph mark. According to Benedict, there's even a regular steering wheel that can be installed when the Darth Vader car is called upon for high-octane public performances. We always knew Darth was an undercover drift king. Check out the, frankly awesome, video below for more.